Bracelets are awesome jewels, they let you define your style more clearly, they all you to showcase many gems and they are surely the best way to add elegance to your wrist. You could buy a sterling silver or gold bracelet for yourself or, choose one for that special person in your life. Picking a gemstone bracelet that is made to order will allow you to express your style much better. Don't go merely by external beauty and attractive price tags, you want your bracelet to serve you well for a long time. Being fairly big jewels, bracelets require the attention of experience jewelry artisans. A substandard bracelet could snap at the links, this could cause the bracelet to drop off and get lost. Even the best artisan in the world could not make a decent bracelet if, the sufficient metal weight is not assigned to the job. 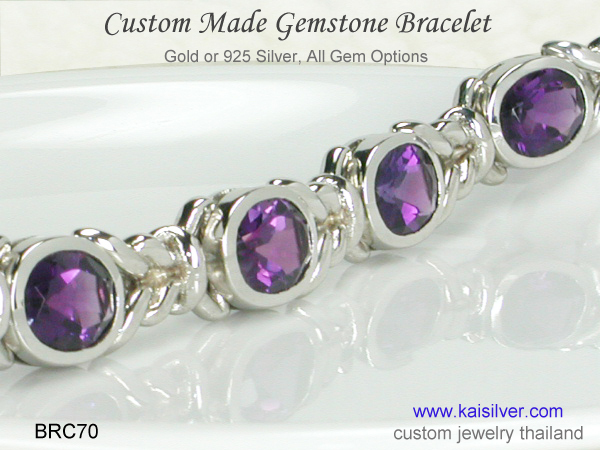 Kaisilver bracelets generally have around, 40% to 60% more gold or silver weight as compared to what other jewelers provide. This along with workmanship from the best craftsmen in the industry, helps us deliver some of the best custom bracelets that you will ever come across. We custom make all bracelets in gold or 925 silver, the design can be yours or ours. There is no limitation on gem selection, a single bracelet can combine different gems. Both 925 silver and gold bracelets have the same quality of workmanship and gems. All bracelets have good metal weight, this adds to their long term durability. Gold bracelets are available in 14k and 18k gold, you can select yellow, pink or white gold. Since all gems are custom cut, you can request for the gemstone shape and size of your choice. 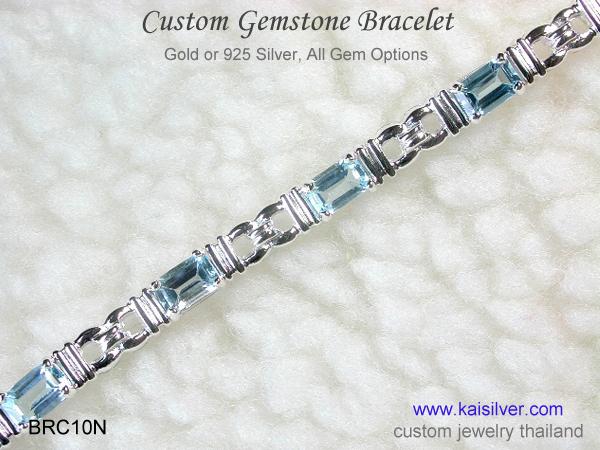 Kaisilver: We are regarded as the leading online global provider for high end made to order jewelry. We can craft any type of jewel that you need in gold or silver with, the gemstones of your choice. Our expertise in gem selection has brought us direct connections with leading, gem mining operations across the globe. We place no restrictions on the gemstones that you choose. You can pick a design from our website or send us images or sketches of your own concepts. Discuss your requirements with our expert team at sales@kaisilver.com they will be glad to advise and suggest even if, you plan to buy nothing from us. A gorgeous bracelet bracelet custom made with gems of your choice. This bracelet has a weight of around 20-25 grams, this will keep it in shape for many years. You can request for this made to order bracelet to be crafted in gold or silver ... more. A sturdy gemstone bracelet with large 10x8mm or 9x7mm oval gemstones. 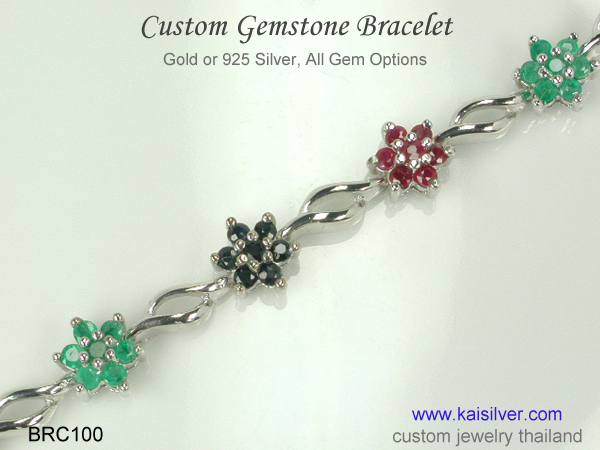 You choose the gems for your 925 silver or gold bracelet, different gems can be combined in the same bracelet. Learn all about the gorgeous BRC70 custom bracelet ... more. An elegant and feminine ruby, sapphire and emerald bracelet. This custom bracelet is shown with the Big Three Gemstones but, you can order the same made to order bracelet in gold or 925 sterling silver, with the gemstones of your choice ... more.